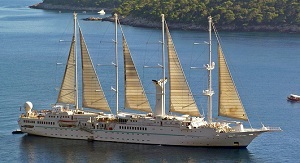 Wind Star, one of three tall ships in Windstar Cruises' fleet, has recently completed a stem to stern renovation, bringing a modern, casual elegance to the brand's landmark cruise experience. As part of the $18 million fleet-wide renovation, Wind Star was the first yacht to receive redesigned staterooms and owner's suites and enhanced public areas. "We have a company-wide commitment to ensuring our yachts are in excellent condition," said Hans Birkholz, Chief Executive Officer and President of Windstar Cruises. "The vision for the renovation is a classic, stylish luxury that dramatizes the unique thrill of sailing and a private yacht experience." Wind Star's decor was updated with new furnishings, upholstery, art, lighting, wall coverings, carpeting, ceiling finishes, window treatments, and floor coverings. The design palette combines sand and marine colors contrasting elegantly with the warmth of wood finishes, elevating the look and feel to stylish luxury at sea. The Restaurant was transformed into a whole new dining experience as AmphorA Restaurant including a redesigned seating layout, and state-of-the-art wine display and storage. A new menu was introduced featuring savory dishes such as Dover sole, duck a l'orange and lobster ravioli. The Veranda's outdoor seating was significantly expanded, creating an ideal mid-ship area for guests to enjoy breakfast and lunch alfresco. The interior includes a new buffet, new lighting, and epicurean style display counters. The Compass Rose was also reconfigured to open up expansively to the adjoining outdoor deck. The Lounge – new hardwood flooring was put in, accented with inset rugs, a new mix of contemporary furniture, and a lighter color palette. A new AV system was also put in place. Casino – installed new sound insulation. Reception Area – received a make-over with new artwork and a fresh color palette. The Pool Bar – redesigned to offer a more engaging and upscale social experience by creating additional alfresco seating for sunset dining at Candles Grill with new awning and deck furniture. Library – enhanced to promote a more relaxing atmosphere. Wind Spa – received a soft goods update. "So far the feedback on Wind Star's renovation has been excellent," said Birkholz. "We wanted to really enhance the feeling of being on your own personal yacht, and I think we've succeeded." As part of the $18 million renovation project, Windstar Cruises has already redesigned the fleet's staterooms and suites. The newly enhanced rooms showcase new leather headboards, stately arm chairs, linen wall coverings, new lighting features, window coverings, plush wool carpeting, new art work, stylish bed cushions and luxurious bed throws. Additionally, the owner's suite received new furniture. The billowing white sails that make Windstar Cruises famous were also replaced. Over 69,000 square feet of hand-crafted sails, equivalent to 1.5 acres, were ordered. Wind Spirit, the last of the fleet to receive the order, hoisted the sails up last week. The next phase in the renovation project will include the complete enhancement of Wind Surf, previewing on December 1, 2012 and Wind Spirit, completed on December 22, 2012.